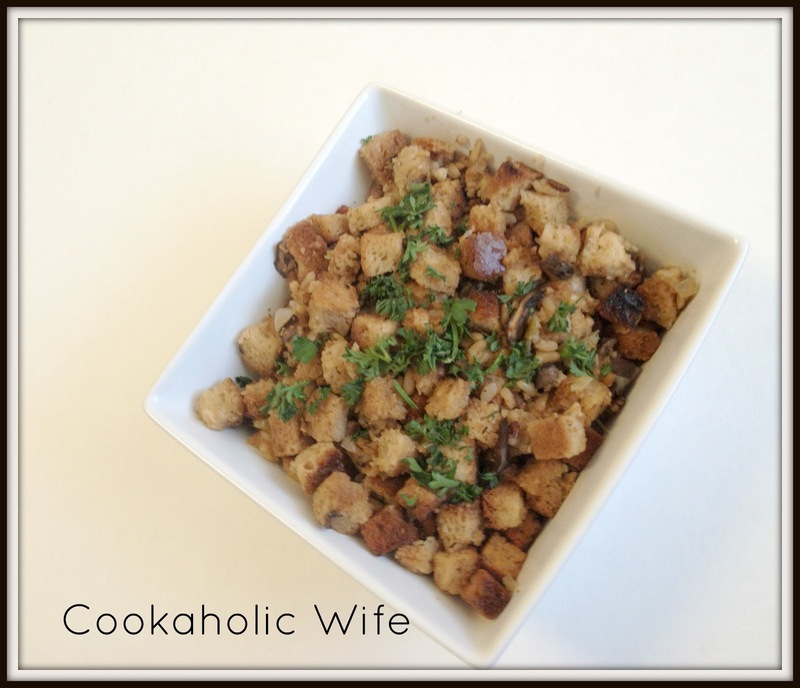 Stuffing or dressing? Which do you call it? I call it stuffing even though it wasn’t put into any unpleasant places on a bird and then baked. Dressing just sounds funny to me. You aren’t dressing the turkey with it. It’s not clothing. Then again, unstuffed stuffing isn’t that much better of a term either. I need to create a new word for this. Any suggestions? My aunt always makes a sweeter version and I prefer a more savory take as I like mine covered with gravy. I’d heard of wild rice and mushroom stuffings (or dressings) before but I decided to go against my usual of everything from scratch here and incorporated some quick cooking ingredients to speed this up a bit. 1. In a large skillet melt the butter over medium heat. Add the onions, celery and mushrooms and cook for 5-7 minutes, stirring frequently. Season the mixture with salt and pepper. 2. Combine the seasoned croutons and rice together in a large bowl. Add the mushroom mixture, sage, thyme and chicken broth. Stir until combined and the croutons are moistened. 3. Transfer to a large baking dish and bake for 40 minutes at 325. I thought this was pretty good but I would have preferred more mushrooms and for the rice and croutons to stick together more. I blame the croutons and think I’ll go back to my original way of making stuffing which involves toasting and then dicing up a loaf of bread to mix into everything else.